A Square Foot Garden solves the small space gardening dilemma. The Square Foot Garden allows for more plantings to thrive in a given space. The perfect small space gardening solution, square gardening methods are a great urban or suburban option. This type of garden is marked off in squares; each square measuring one square foot, hence the name. Gardeners with limited space may want to try this gardening method in order to maximize planting space and garden yields. A garden planted in a grid pattern allows the gardener to grow more plants in less space. Almost half of a typical garden's overall area is empty space between rows. Planting in a grid pattern eliminates the need for rows and makes that space available for plants. What is a Square Foot Garden? Gardening in a square foot grid is an intensive method of planting characterized by dividing the garden into one foot sections. In general, one square foot of garden space is allocated to a plant. This method increases garden yields as it eliminates the need for rows of empty space between the planted rows. Additionally it makes it easier to tend to the plant's needs and make soil amendments as each individual requires. The typical square foot grid garden integrates raised bed gardening and container gardening methods. Raised beds lend themselves well to this gardening style, especially when the bed is enclosed with wood or other material. Using wood to contain the garden allows for ease in marking the squares. Set up the garden as a raised bed garden. Start with a garden that is no more than 4 feet wide so that you can easily reach in to the plants from each side without having to step into the garden. 3 feet is also a comfortable width and if you'll only be able to access your garden from one side (if the garden is against a wall or fence) it should be no wider than 2 feet. An ideal small garden would be three feet by eight feet. This gives you a total of 24 complete squares. To calculate the square foot of the bed, use the formula for area: length (in feet) X width (in feet) = square feet. An ideal small space gardening solution, square foot gardens are divided into one square foot sections. This can be accomplished by marking the soil with garden lime, by adding actual string dividers or with dividers made for this purpose. To measure, start at one end of the bed and mark off one foot sections along the length of the garden. Repeat this process along the width of the garden bed. Tie the string from marker to marker or just draw lines. Plants are placed in the center of each square. Some plants will require more or less than one square foot - for small plants, like radishes, the square can be divided into square inches allowing 2 square inches per plant. Alternatively, larger plants will be allotted 2 square feet. The versatility of square foot gardening is that it creates a grid. This grid enables the gardener to quickly and easily change the garden layout to accommodate different plants. For example spring vegetables like spinach, lettuce and radish will be harvested early in the growing season leaving a space for fall crops to be planted. Grids are easy to work with. Planning your garden can be done on graph paper or by using a computer. Just load any paint program, bring up a grid and mark off your garden design. Using paper or a computer will allow the square foot gardener to quickly arrange and rearrange the garden design. This will enable the gardener to obtain the garden that perfectly suits his or her needs. Square foot gardening takes a little bit of getting used to. Beginners can try a small garden first, and then move up to a larger garden when they feel more comfortable. 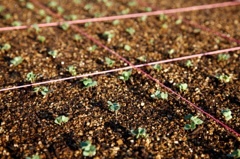 Once you start gardening using the square foot planting method you will find that it is easier to maintain and plan than the traditional garden that is planted in rows.